The Bangalore Conservatory is a Music College founded to provide quality Music training, comparable to the finest music degree granting institutions in the world. We were founded originally to train musicians for service in the Christian church. As our service of music training to the Indian community has expanded over the years, we have added degrees to meet the professional training of our students. Our goal is to provide space for the serious music students at an affordable cost so that there is no need to leave the country in order to obtain world-class music training. The Training is combined with academic study and professional development. Students have an opportunity to perform regularly, exhibiting their talent and expertise throughout their three years of study through weekly recitals and several public concerts during each year. Students also have practical music teaching experience before they graduate. We offer Bachelor of Music and Master of Music degrees in Western Classical Music. Our faculty is among the finest music teachers in the country. RESPECT. As a community we learn to acknowledge and accept one another as God’s unique and wonderful creation. HARD -WORK. The basis of excellence in all areas of life, and the key to satisfaction and wellbeing is hard work. CONSISTENCY is a means of accomplishing great works as we commit to hard work on a daily basis. GROWTH. We value the process that is required to attain excellence-our interest is in continuous development; where we are going is more important than where we have been or even where we are now. INTEGRITY. Students staff, and faculty are accountable and honest with themselves and one another as we live in community. CONSERVATION. We endeavor to live in such a way that if all people and organizations behaved as we do, the world would be more verdant and healthier. The Bangalore Conservatory provides an ideal environment for musical training, and is strategically located in the heart of the city, with easy access off Hennur Bagalur Road. Our campus is a quiet oasis in a bustling urban environment. We have designated classrooms, individual practice rooms, jam rooms, keyboard lab, and a Concert/Chapel Hall on our 4,000 square foot facility. The Bangalore Conservatory is registered as a Non-profit organisation under Indian Trust Act (1882) and is recognized by the Government of Karnataka. We are in process to attain the status of Equivalency with the National Association of Schools of Music, the largest and most prestigious music accreditation organization in the U.S. 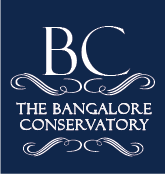 The Bangalore Conservatory was founded by Kenneth Henson who is currently serving as its Director. He has trained singers, performers and professional groups in the art of Vocal Performance in the US, India and several other countries. He has designed training programs for the use of the voice as an instrument of performance and communication. Ken earned his Bachelor of Arts degree in Vocal Performance from California State University, Fullerton and Master of Arts in Religion from Vanguard University. “We are grateful to God for the extraordinary accomplishments of our students. Our graduates are full-time professional music educators and performers. Many of our current students are accomplished musicians, having won awards and national recognition in performance, composition, and church music leadership.